Rival Gaming makes a big splash on January 27, 2015 with the launch of their new video slot, Whale O' Winnings, and a $20 Free Play bonus at Desert Nights Casino. 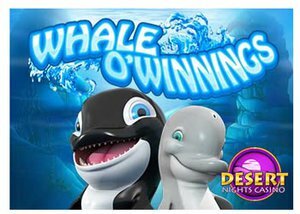 Rival Gaming puts their best flipper forward with the January 27, 2015 release of their newest video slot machine, Whale O' Winnings at Desert Nights Casino. This five reel game features 50 pay lines, meaning that there are many ways to win with the orca the game is named after on mobile, instant play, and casino download platforms. The cute and cartoonish characters and animations in the game include life preservers, sea urchins, sea lions, dolphins, sunken treasure chests and bags, clams, sand dollars, and stylized symbols for Ace, King, Queen, Jack, 10, and 9 card faces. Each has it's own pay scale for landing three, four, or five of each along a winning pay line. For example, three treasure chests pays 50 tokens, four gives 250 tokens, and five treasure chests will give 2500. Whale O' Winnings himself serves as a Wild in the game and can increase any winning combination in order to make a payout even better through a 3 times multiplier. Landing a combination of Wild symbols scales up quite quickly as well with two on a pay line giving 7 tokens, three giving 77, four paying 777, and five Wild symbols together shows an amazing 7777 tokens as the payout. The Wild symbol isn't the only way to reel in some amazing winnings with the friendly dolphin bringing a chance at free spins and a pay out multiplier with every spin. Three dolphins gives ten free spins, four give 15 free spins, and five will bring an amazing 50 free spins. Every play in the dolphin's free spin mode will be subject to doubled payouts, meaning that getting extremely lucky and landing five Wilds in Free Spin mode would pay out 15554 tokens! Looking for a place to make waves with Whale O' Winnings but can't make up your mind? Head over to Desert Nights Casino where all players can take advantage of a bonus unique to this game. 100% of your deposit will be matched up to $500, making for a possibly $1000 in your bankroll to get rolling with. Additionally, there will be a $20 Free Play bonus for Whale O' Winnings credited to your account. In order to take advantage of this offer, a $25 minimum deposit is required and, while there is no maximum cash out limit, there is a 28 times play through required in order to make a withdrawal against the bonus amounts. There's no better time to take a dive into the new and fun video slot machine brought to you by Rival Gaming!